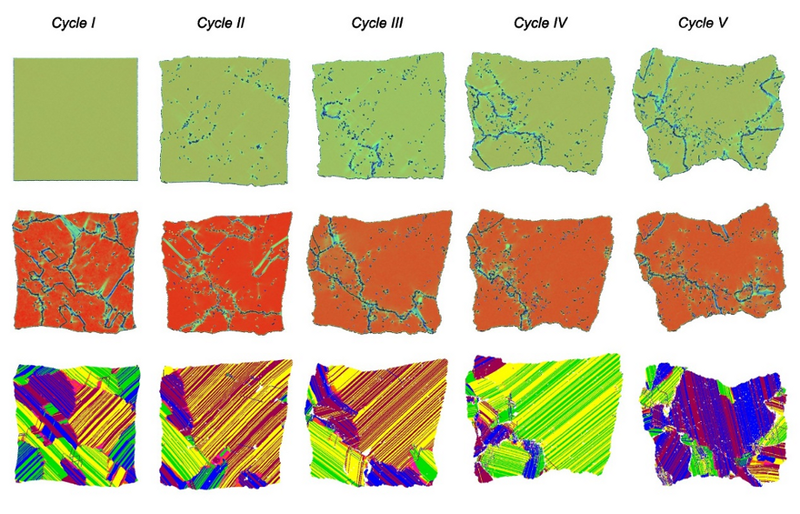 Evolution of microstructure during thermal cycling of a model shape memory alloy (2D molecular dynamic simulation, Habilitation O. Kastner, Bochum 2010). After 12 years of funding by our German Research Association DFG, the collaborative research centre SFB459 on shape memory technology has come to an end. We have managed this activity scientifically and have led it through four assessments into four subsequent 3-year funding periods. SFB459 has strongly influenced both research and teaching at our Chair and at the Institute for Materials. We have been able to make a name for ourselves in this fascinating area of research, achieving conspicuous visibility throughout the world, both in terms of basic research as well as in manufacturing and applications. We were able to greatly improve the experimental infrastructure of our Chair and of our In-stitute for Materials in the fields of electron microscope, ingot metallurgy and the mechanical testing of materials. In addition, a whole series of new research groups were established within the orbit of SFB459. We are in close contact with many leading research groups in the field of shape memory technology and will continue in future to vigorously conduct research in this area. As part of the SFB459 project, we have been able to make significant contributions, across diverse fields, towards a clearer understanding of materials science. We proposed a new method for producing high purity NiTi alloys. We deciphered how precipitates affect the mar-tensitic transformation, we gained new insights into the nature of the interaction between dis-location plasticity and the martensitic transformation and in particular we can now explain the elementary processes that determine structural and functional fatigue of shape memory alloys. Please contact us in case you need a partner with a proven research track record in materials science and engineering of shape memory alloys.